With sea ice in the Arctic melting at an alarming rate, opportunities for trans-Arctic shipping are opening up, and by mid-century ships will be able to sail right over the North Pole – something not previously possible for humankind. UConn geographer Scott Stephenson and colleagues say the growth of trans-Arctic shipping and the increase in emissions that will accompany it may offset some of the overall warming trend in the Arctic by the end of the century. Their study was published Sept. 12 in Geophysical Research Letters. At the same time, they caution that this effect is relatively minor in the context of overall global warming, and that more ships in the Arctic would heighten the risk of environmental disasters. By modeling changes in climate trends associated with increases in shipping traffic and subsequent increases in emissions, the researchers found that trans-Arctic shipping offsets some of the overall warming trend in the Arctic by the end of the century. "The results surprised us," says Stephenson, an assistant professor of geography in the College of Liberal Arts and Sciences. "We didn't know if we would see a clear signal of warming or cooling, and the fact that we saw a clear cooling trend was unexpected." Scientists have been aware for some time that shipping routes may affect climate in two competing ways, Stephenson says. With an increase in emissions, there is an increase in black carbon released. This sooty black carbon settles on highly reflective surfaces such as snow and ice, reducing the reflection of solar radiation, meaning the surfaces hold the radiation as heat. The other way shipping emissions affect climate is through the sulfur dioxide released as another bi-product of fuel combustion. Rather than warming, however, Stephenson says the sulfur emissions play a role in cooling by encouraging the formation of cloud droplets and by scattering incoming sunlight. 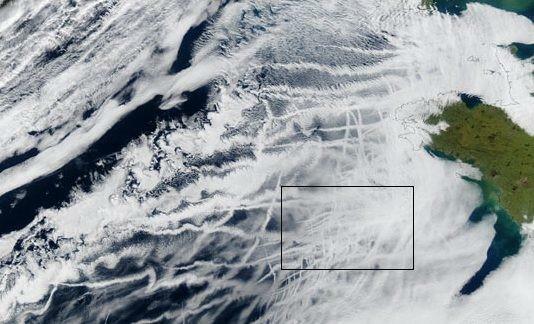 Ship tracks form when very small, airborne particles emitted in the exhaust of large ships (and airplanes) attract water molecules, acting as 'seeds' (or 'cloud condensation nuclei') for clouds. Continued accumulation of droplets on the cloud condensation nuclei forms the thin, streaky clouds. "This is why you often see a trailing track of clouds following ships," he says. "They call those ship tracks." Although the impacts of emissions have been investigated in the past, Stephenson says this study presents a more realistic and robust scenario, as it builds on the earlier studies and uses a fully coupled Earth system model, including projected emissions for future trans-Arctic shipping from 2006 to 2099, making it more dynamic. The team also took into account the changing nature of sea ice through the seasons and how that would impact shipping routes. With shifts in shipping routes come shifts in where emissions would be deposited. "Previous studies have more or less treated Arctic shipping routes as static, meaning the routes do not vary with the season and with the growth and shrinking of the ice," Stephenson says. "We believe this is an important piece of the puzzle – to better model where ships might be able to go over the course of the 21st century." Shipping trends were estimated by taking into account the necessary transport of goods for each Europe to Asia port per month. Fuel needs were calculated and emission totals were determined. The researchers also factored in global anthropogenic (human-caused) greenhouse gas concentration trajectories, adopted by the International Panel on Climate Change (IPCC), at a level closely aligning with today's trends, along with global economic output that will drive the transport of goods. "We attempted to fully integrate the interactions between the various components of the climate system in ways that have not been done before," Stephenson says. The main result was that the cooling effect won out over the warming effect in the simulations, to the tune of about one degree Celsius. Yet Stephenson cautions that, although it's a clear cooling result, it's relatively minor in the grand scheme of global warming projected in the Arctic: "We're talking about a slowing of the warming, but not a halting of the warming." The Arctic continues to warm at twice the global average, and though increased shipping will likely have a cooling impact on the region, the researchers stress that these results should not be interpreted as an endorsement for Arctic shipping, especially as a potential solution to climate change. Stephenson notes that while trans-Arctic shipping routes would cut travel time by as much as 40 percent, growth in shipping traffic would mean heightened risk of oil spills and clearer access to extractable resources such as oil, gas, and minerals in the region – all scenarios that come with potentially dire environmental consequences should an accident occur. With fewer amenities within reach to respond to a potential disaster, responders would be faced with huge logistical challenges to deal with those scenarios. "There are clear economic benefits to shipping in the Arctic, with shorter routes and less fuel being burned," he says, "but there are also enormous potential risks." Additionally, the cooling could be offset by international regulation and trade agreements, for instance if planned global limits on sulfur emissions from fuel used by the ships go into effect. Without the sulfur-induced cloud formation, the cloud-driven cooling effect will not happen. Stephenson concludes, "The mild cooling shown by these results is, we think, a significant piece in the puzzle of understanding the complexities of the interactions between humans and the climate system. It's important to take account of this."